The new 51MP Canon 5Ds (and 5Ds R) shipped in June 2015, and Keith decided that it was time to update his long serving Canon 1Ds mark 3. 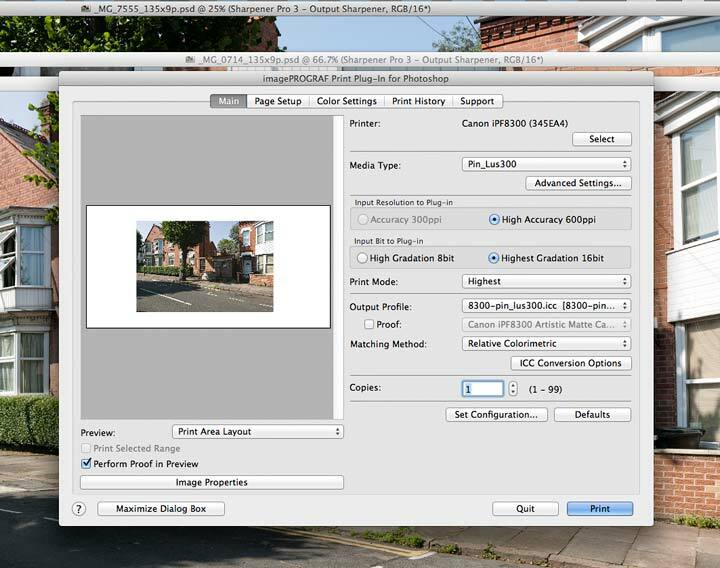 We’ll have more about using the 5Ds in due course (see our main 5Ds page for latest information and links) but this article looks at a very specific use that is a key part of our commercial photo business: Making (large) prints of pictures of buildings for our clients. Do you need the 5Ds? Let me start by saying that the 5Ds is a superb camera. In all kinds of ways it shows the advances between my 2007 Canon 1Ds3 and current design. The AF is better, with many more adjustments and settings, the screen on the back is brighter and sharper, and obviously the sensor has well over twice the pixel count. It’s better at high ISO, beating the 3200 maximum of the 1Ds3 by a couple of stops. It writes to cards much faster and offers wider customisation options. Do the better specs really make for better results than older kit? It’s this usage that amongst other considerations, led me to skip getting the Canon 1D X – a superb camera, but largely irrelevant for my work (some of my reasons for skipping the 1D X). Yes, I’m one of those people who never thought of the 1D X as anything other than a full frame 1D series camera (1D ‘mark V’) and never believed Canon’s line about it being the successor to the 1Ds mark 3. I’ve used the 1Ds mark 3 since November 2007, and switched full time to the 5Ds at the end of June 2015, after a couple of weeks. I’m still experimenting with the 5Ds to get comfortable with using it (I’d still have preferred the sensor in a 1 series body, but, the smaller body is growing on me). 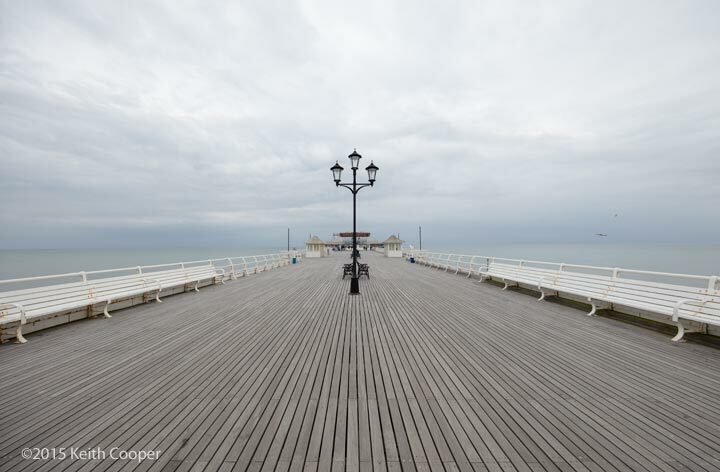 This (UK summer) photo was taken with the new Canon EF11-24 F4L lens on a short break in Cromer – where I learned that the little battery of my 5Ds really does get used up quicker than the big one in my 1Ds3. So, the 1Ds3 is now my backup body – my old (2004) 1Ds is now reserve backup along with my 100D (used for some macro work and ‘documentary/notetaking’ type shots on jobs). 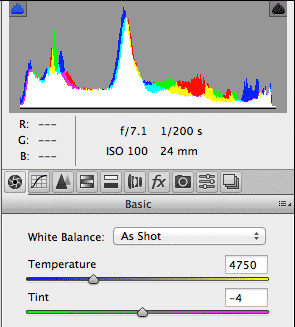 It was looking at a black and white landscape print at ~26″ x17″ on our wall, that was taken with the 1Ds in 2004, when I wondered just how print output from 5Ds images would compare with the 1Ds3 and even the 1Ds? How about the basic performance? – well, now that DxO have added the 5Ds to their measurements, we get this comparison. There is much debate about the relevance of the numbers (see the 5Ds page for some) but we can see progression from 2002 (1Ds launch) to 2015 (5Ds launch). 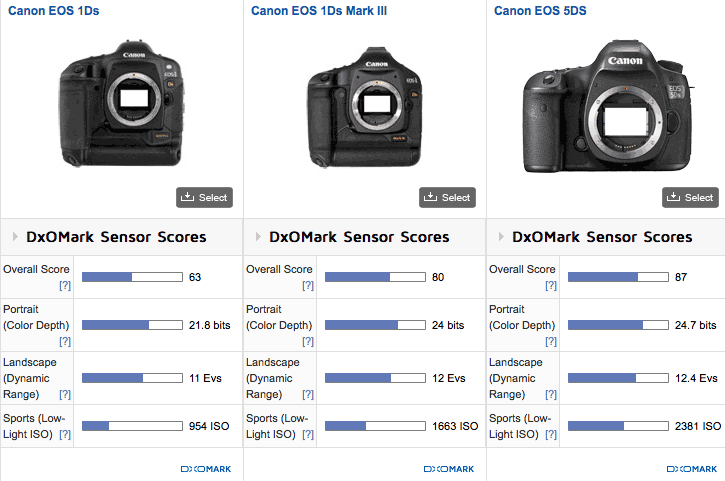 Ignoring the details of DxO’s numbers, you see an overall change that suggests that the differences between the cameras should be quite obvious. When I first got the 1Ds3, it was pretty much a doubling in pixel count, however the difference I most noticed in handling images for print was the improved quality of shadow detail. In particular, noise was finer textured (more pixels) but there was minimal pattern noise in the deeper shadow areas. This made it easier to reduce exposure a bit to ensure I kept detail in highlights. First impressions of using the 5Ds are that once again there is much finer noise (that MP increase again) and shadow detail is cleaner than the 1Ds3. 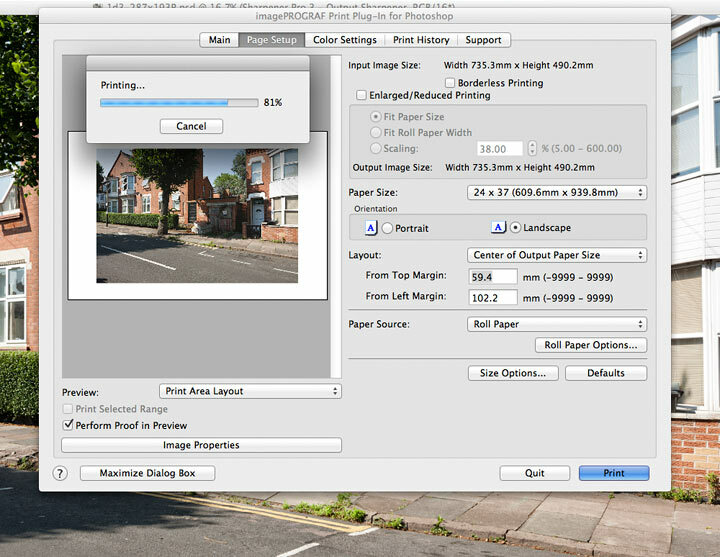 In producing images for print, you are always dealing with a reduction of dynamic range to fit the much reduced limits imposed by ink on paper. 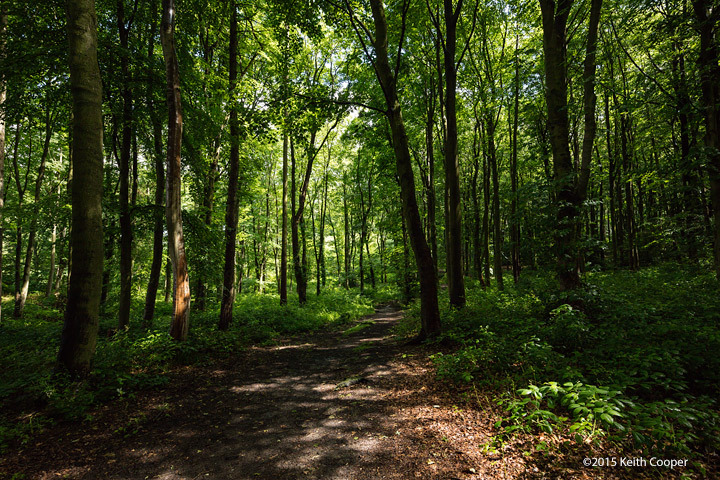 Take this woodland scene – to keep colour in the bits of blue sky and preserve detail in leaves silhouetted against sky, the majority of the darker areas are quite underexposed and pushed (~2 stops) during RAW processing. Even so, with fairly light noise reduction in ACR, noise levels in the darkest areas are never going to show up in a print. If I was going to print this image, it’s one I’d look at processing with DxO Optics Pro (V10 review), which handles noise very well. Here’s a zoomed view from when I was processing the image (between the two trees in the middle of the image above). I know from experience that I could have got a usable shot with the 1Ds3, but it would need more care in handling the shadows. So, from the start I’m happy that the 5Ds is delivering images that are easier to work with – OK, they are bigger files, but frankly I don’t care, since disk storage and computer memory are hardly expensive (remember that I’m using it for my business). It’s all good and well looking at 100% crops of screen images, but what of real prints? If you’re making prints of your photos, then surely that 51MP sensor should stand out a mile against my old 1Ds and even the 1Ds3? I waited for a nice sunny day and photographed the view across the road where I live. This combines buildings and trees, with some solid shadow and is a very convenient proxy for a lot of the sorts of work I’ll do, and not too bad for my landscape photos as well (although they are invariably hand-held). 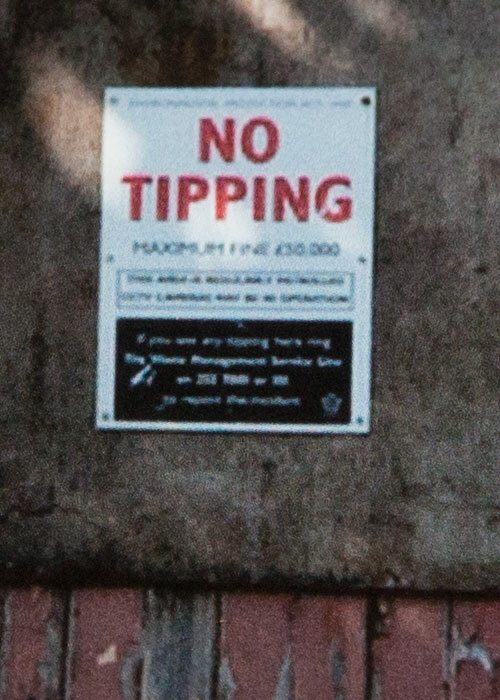 I’ve used the TS-E24mm lens, unshifted, manually focused on the ‘No Tipping’ sign. The lens is a good one, and I’ve used it at f/7.1. Now I know that some will be reaching for the phone to remind me that the aperture is small enough that effects of diffraction could show… My response is that the TS-E24 image quality improvements at smaller apertures, not to mention the better depth of field, mean that I’m far more likely to use a lens like this (when shifted) at smaller apertures, than ‘optimal’ to reduce diffraction. I’m using a hefty tripod, with cable release, and for the 5Ds, a 1/4 second delay between mirror going up and shutter opening. With the 1Ds3 and 5Ds I’m focusing with liveview. With the 1Ds I’ve got my old Canon Anglefinder ‘C’ – which fits over the viewfinder and can be switched to a magnified view. This represents fairly well how I’d use the kit on a job. 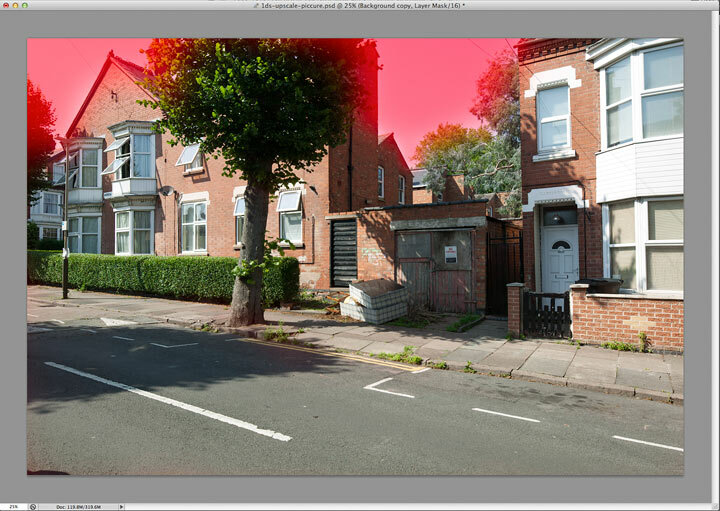 I’m processing the RAW files in Adobe Camera Raw, since (in PS CS6) it’s my normal file conversion option – I have other software, but this is what I’d normally use. The framing varies a little since I used different camera baseplates and didn’t precisely check they were all attached the same. 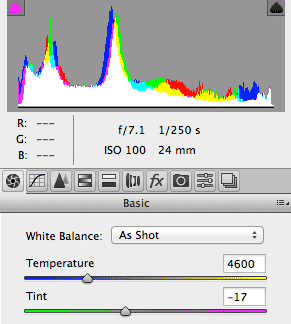 The most obvious difference is that the white balance (WB) is different. The 1Ds (right) was always easy to fool this way, since it has an external sensor (a white dot on the body). That tree/sky and very red brick were one of the reasons I’ve long carried a grey card with me. The photos were taken within a few minutes of each other, just with time to change camera and double check focus. 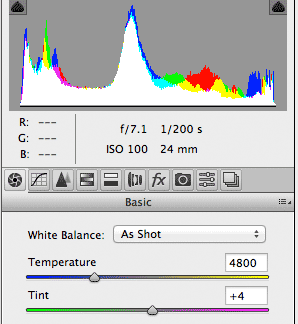 One issue was how to decide which exposures to use? The screenshots here show the different initial WB settings for the pictures I decided to use. Even after setting WB for each image (using part of the white UPVC window frames) these three files were the ones I decided to use. One minor thing to note is that the 1Ds (right) is 1/250s rather than the 1/200s of the 1Ds3 and 5Ds. I’m going to use standard Adobe defaults for the conversions, since that’s what I’d normally start with. I have a whole load of custom DNG profiles for the 1Ds/1Ds3, but have not experimented with the 5Ds enough yet to decide which ones I prefer (other than creating one for the CFL lights I use for some product work – ColorChecker Passport review). Note: The current X-Rite Passport software chokes on the big 5Ds RAW files but if you save a sRAW, then you can still create profiles. X-Rite assure me that a fix is on its way. The images needed fairly minor adjustment in shadow settings to get each one looking fairly similar, and to an overall tonality I was happy with for print. So I end up with three views of the same scene at 11MP, 21MP and 51MP. Each image was printed at its native size, at 300ppi. However, each image was also printed at the native size of the other cameras – upsizing or downsizing as needed. I’ll have more details of this, but the idea is that I ended up with 9 prints. 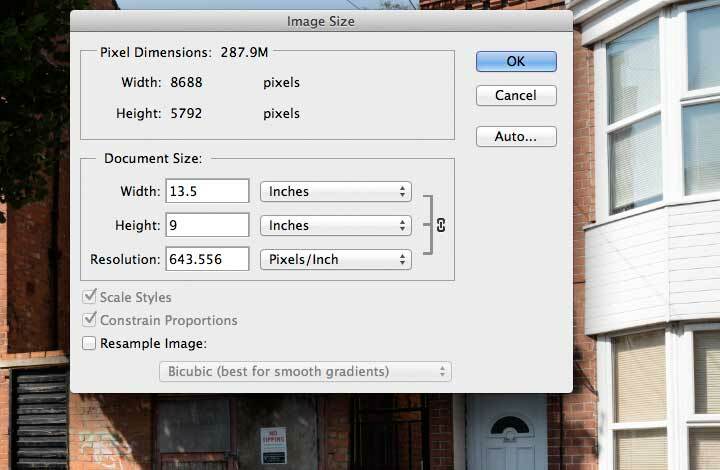 The 1Ds file size equates to 13.5″ x 9″ at 300 ppi. I’m printing on a lustre finish paper on our Canon iPF8300 printer. 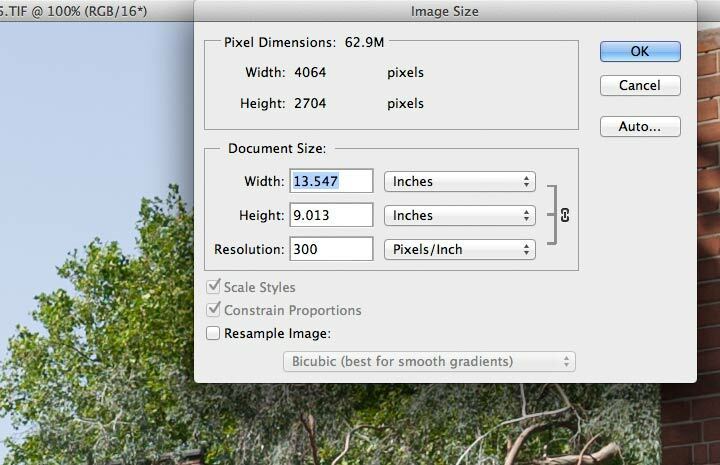 The Photoshop plugin I use for printing happily handles image data at any resolution and I know it prints just fine at 300 ppi or higher. Indeed, I’ve printed many 1Ds and 1Ds3 files at 240 ppi and they look fine. I’m using one of my own custom ICC printer profiles. Since print sharpening is a vital component of any good print workflow, I’m sharpening each image to the amount I feel is best. BTW Using ‘sharpen for print’ automatic settings (as in Lightroom) is fine for snaps and bulk printing (weddings/events), but doesn’t quite cut it (IMHO) once you start producing individual images of any significant size. Here’s the size of the 1Ds file. 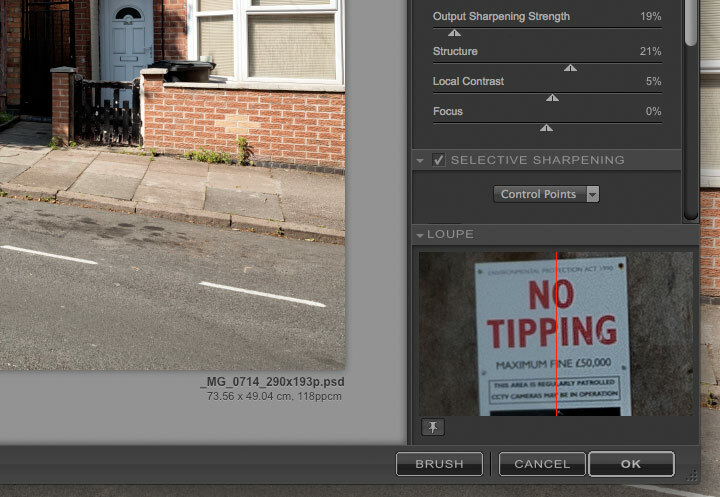 Here’s the 1Ds3 file – the resolution goes up to 416 ppi. I know from experience that the Canon driver will make use of higher resolution input data in its internal resampling, so no need to stick to 300. The 5Ds file comes in at a hefty ~640ppi. 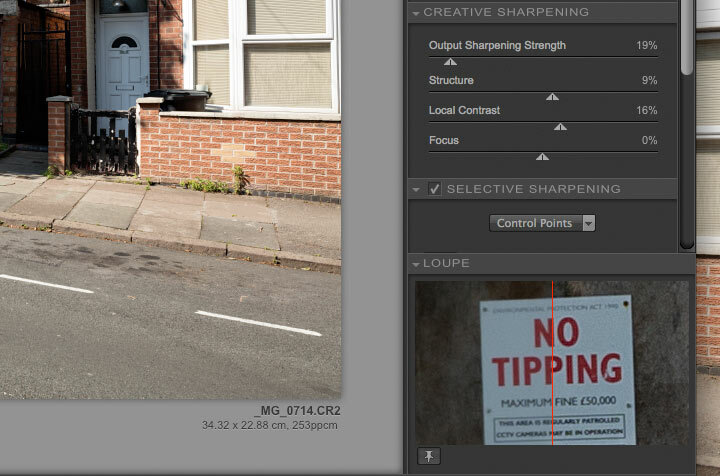 This means that sharpening is a bit different. I wouldn’t normally print at this resolution but did a couple of test prints and decided that sending higher native resolution made a difference, albeit one that took very careful inspection under high magnification to see. 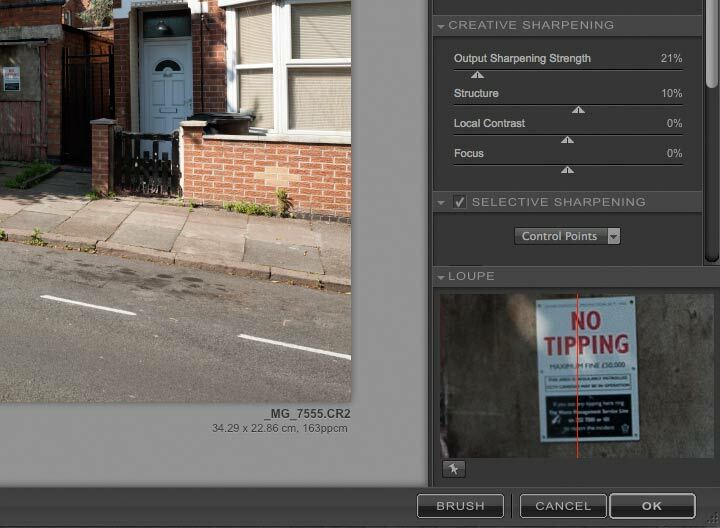 For print sharpening I used Nik Sharpener Pro V3 – software I first reviewed several years ago, and still regularly return to. 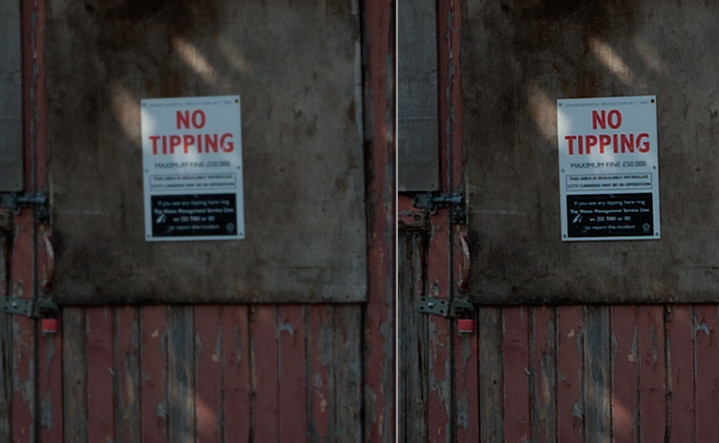 The two shots below show the sharpening applied to the reduced size (13.5″ x 9″) 1Ds3 and 5Ds prints. I’d note that settings varied for image size and for camera. 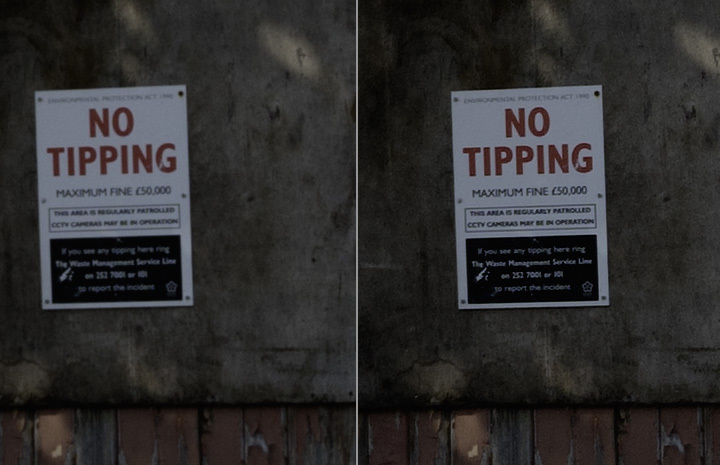 The resolution difference is quite different in the 100% loupe views. When working on individual images for prints, upscaling is not for me about what plugin to use or best interpolation method, but about understanding the content of the image, its structure and what areas of the print that sharpness matters (and where it doesn’t). In my architectural work, I’ve had to scale 1Ds and 1Ds3 images to wall size, and have found that the upscaling needs to start with considerations right at the RAW processing stage. I’ve written up elsewhere about some of this (making a wall sized print) so won’t go into details here. Upscaling by one step is pretty straightforward, so a 30″x20″ print from the 1Ds3 is not pushing things too hard if you are careful. A 30″x20″ from the 11MP 1Ds is more problematic, depending on the subject, although I’d note that I’ve exhibited a 60″x40″ print from the 1Ds in the past, and not one person mentioned any lack of detail. 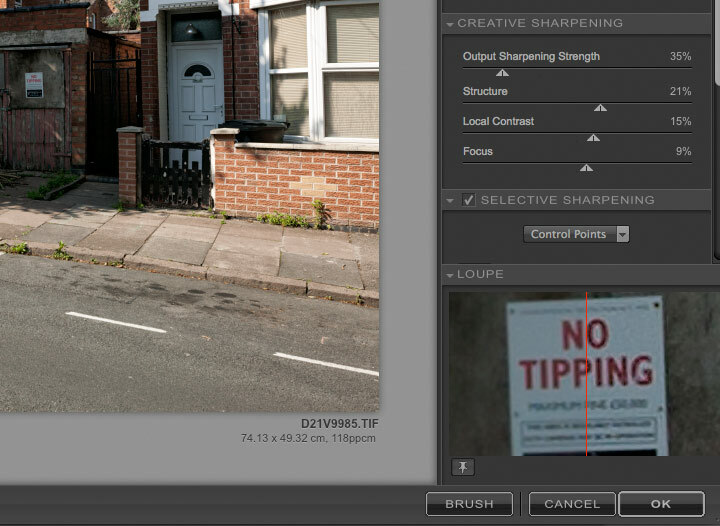 Selective use of sharpening tools such as Focus Magic and Piccure+ are important, as well as Nik Sharpener 3. Remember that this is a 100% view of an image for a print. The note about it being for a print is important. It takes experience and experimenting to know when what looks over processed at 100% will improve a print and when it may not. See the Nik sharpener reviews for more about this – patches of snow on far mountains illustrate this well. 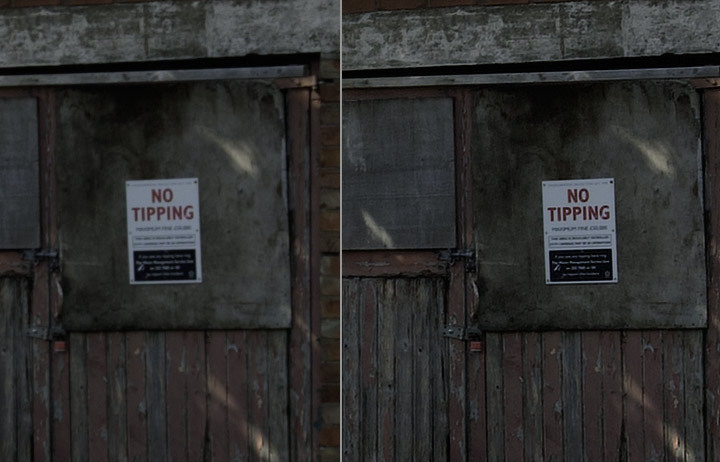 In the example above, those phone cables are the sorts of thing that show up over sharpening, even when the level applied may be just fine for other parts of the image. For the 1Ds image (13×9) I’ve used Piccure+ on a duplicate layer. This I’ve masked off (red areas), where I felt it was too powerful (clear blue skies never need any sharpening). Next up, three examples of using Piccure+ on the original images (unsharpened at 100%) remind me that there is only so much information in the original images. (BTW ignore the colour differences – piccure+ has issues with some colour spaces -this reflects my grabbing of screen shots, not the actual file colours, which I’ve matched during processing). 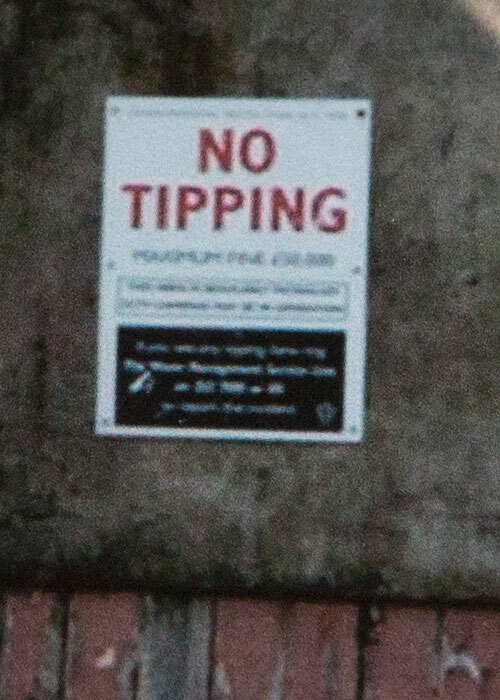 However – this is on screen. What difference does it make for actual prints? Here are three screen shots showing the same detail, as would be sent to the printer. The settings are what I feel works best for the whole image. I’m printing the large versions on the same 24″ roll of 300gsm Lustre paper (Pinnacle Lustre 300). So, what differences are there? 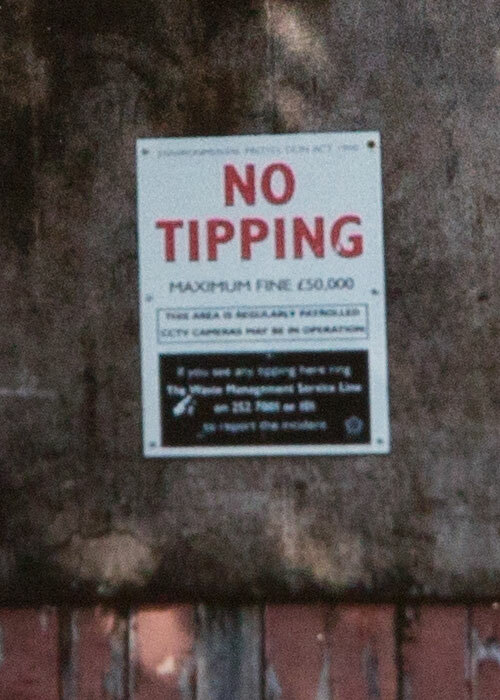 At ~13×9 there is virtually no difference visible without getting a powerful magnifying glass out, where the £50,000 is just readable on the 5Ds print. It confirms though that printing at ~600ppi of ‘real’ resolution can give a fractionally sharper print on my Canon iPF8300 (see my iPF6300 and iPF6400 reviews for more about Canon printers I’ve used here). 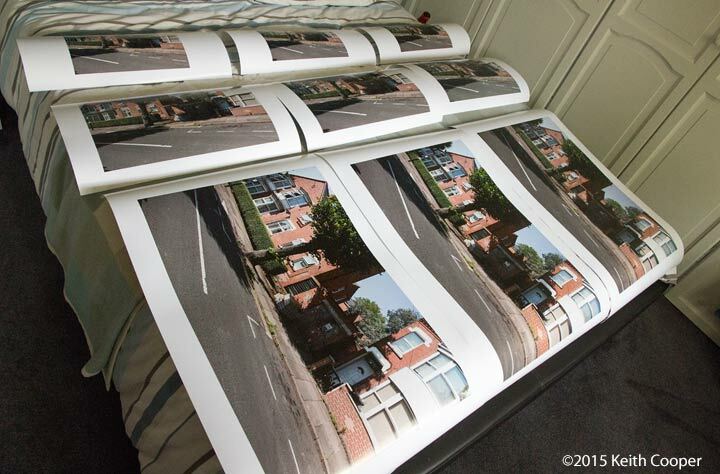 The three photos below are of the actual 29″x19″ prints (taken with my 100D and built-in flash). Yes, the 5Ds images are notably superior in resolution, but when it comes to making prints there is an important consideration. Not one of the half dozen non photographers I showed the prints to, mentioned detail in the images. When asked for differences, most popular was spotting the slightly different view, next up was that the brickwork was ‘a bit redder’ in one print. Most common observation – that the council should do something more about the landlords who dump stuff from student housing when clearing houses at the end of the academic year. Yes, it really is about the content of the picture to most people. This backs up my own (and gallery owners I’ve spoken to) experience that people who buy prints don’t carry a magnifying glass with them – they look at what the picture is about and what it means to them. Why do I have the 5Ds? Well, I do make 20″x30″ prints (and larger), and having that extra detail gives me extra freedom in cropping and processing. One example is straightening horizons – the camera may have a built in level, but it’s just not accurate enough. I can spot a 0.25 degree tilt in a horizon, which is rather better than the accuracy of the level. 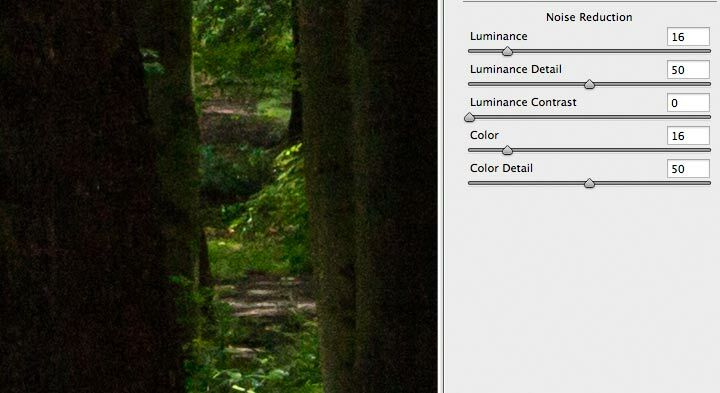 This is easily fixed in Photoshop, but any such adjustment robs you of some detail. 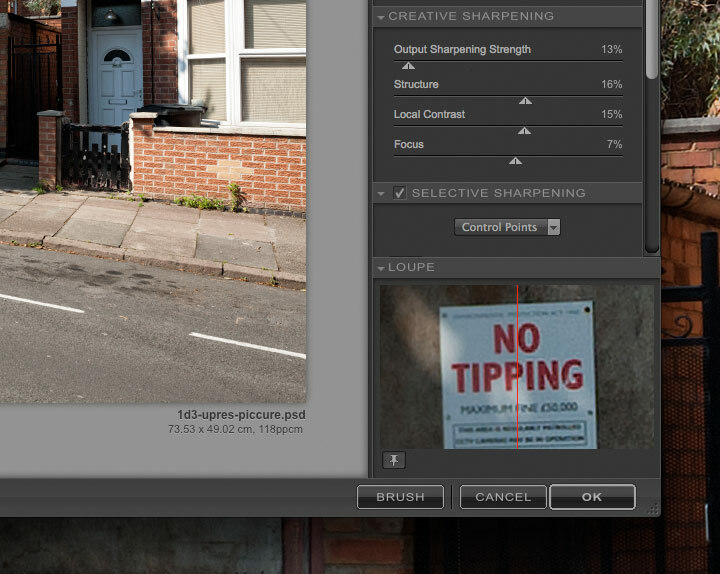 I sometimes stitch images with shift lenses shifted up/down – this now gives me 75MP+ images to work with. The detail helps with big architectural prints. I decided to get the 5Ds over the 5Ds R because I do take photos of structures with fine detail (distant brick walls for example) and often won’t have the chance to return to re-take a shot that has an outbreak of moire. I have been wondering whether I’m missing something out (detail wise) from having the 5Ds? However, after processing images from the 5Ds in a variety of RAW converters, and looking at different post conversion sharpening options, I’m left with wondering how many images of mine would show any noticeable improvement (in their final usage) from having the ‘R’ version? If you don’t print over A3+ size (13″x19″) then any advantage of the 5Ds over the 1Ds3 (or 5D 3) is going to be minimal. Once you start cropping much or going to very big prints then sure, there is a difference, but one that still may not be obvious to anyone else. As a 1Ds3 owner, who never had (real) problems with dynamic range and noise, I’m finding the 5Ds really great to use because of the possibilities it gives for my photos. It’s that doubling of resolution (and partly the lowering of effective shadow noise) that are helping. If you are going to get the best from it, you really do need to make sure your skills in the rest of your workflow, from composition to print, are up to it though. But what about the figures – surely I need to upgrade my lenses? 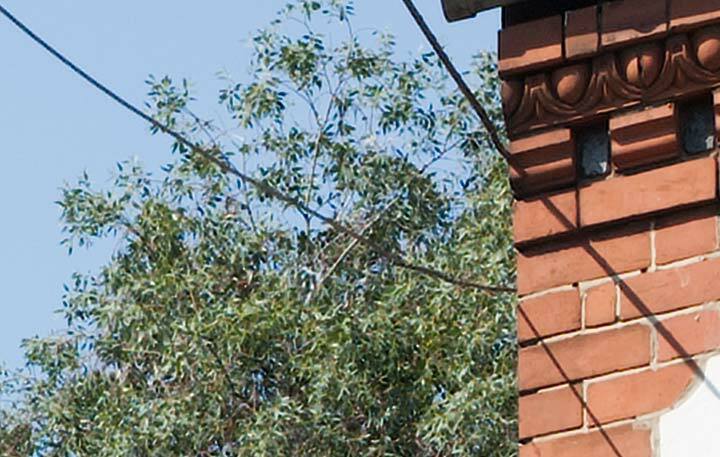 Why would I want some part of a building marginally sharper, when even using lens movements, other parts would more blurred at f/5.6 compared to f/10? The 5Ds is a real jump in performance, but I’m firmly of the opinion that far too many photographers buy new kit with the expectation that it will ‘improve things’ usually in some never defined way. When you are looking at people’s comments about new kit, look to see if they actually have it, and then what do they do with it. Print is just one area I’ve specialised in and used as an example in this article. 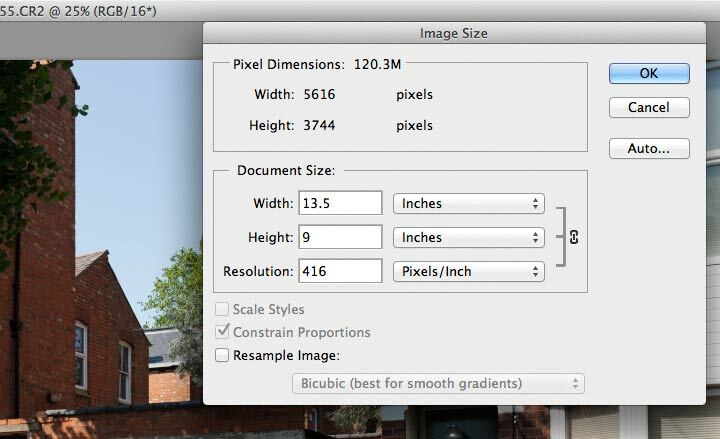 The skills I’ve used in making the 30×20 print from a 1Ds image are directly applicable to making a 42″ x 72″ print from the 5Ds (about as big as I go with our in-house printer for non panoramic images). You may need to upgrade lenses, but don’t forget to upgrade your skills. 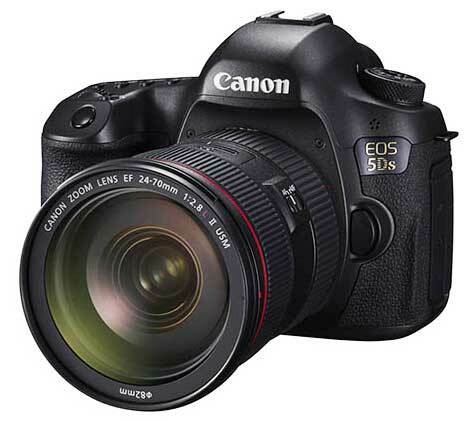 So, do you like the 5Ds?